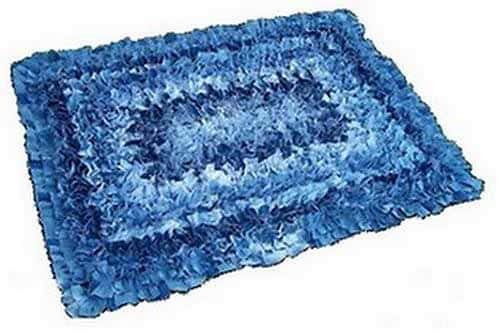 One clothing item that’s always on everybody’s favorite list is blue jeans. Jeans are a versatile must-have for kids and adults alike and a staple in most American closets. In a year’s time, Americans buy more than 450 million pairs! This makes jeans a perfect item to start with when giving your wardrobe (or your kids’ closets) a green makeover – and don’t throw away that old denim just yet. • Go vintage. Hold off on hitting up the mall and head to nearby thrift stores, vintage, and consignment shops first. These stores are usually well stocked with donated denim. Plus, here’s the good part, your jeans will cost significantly less than retail and come with a much smaller carbon footprint – no production required! • Opt for organic. Cotton is the most pesticide-intensive crop out there. Non-organic cotton production is responsible for 11% of global pesticide usage. 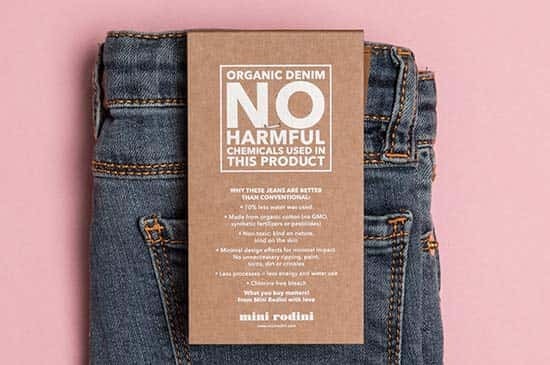 Just a single pair of jeans made from conventional cotton, amounts to 2/3 pound of fertilizer and pesticides. 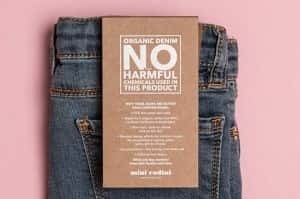 Fortunately, a lot of well-known brands are using organic cotton and non-toxic dyes in their denim collections. Check out Levi’s, Patagonia, Edun’s and Eileen Fisher for some eco-chic options. • Keep it simple. The average woman owns eight pairs of jeans. Now, we love jeans just as much as you do, but do we really need eight pairs in our closets? A good rule of thumb when buying jeans is to search for quality over quantity, and classic styles. High-quality basics will last longer, have more versatility and reduce your overall impact. • Launder responsibly. 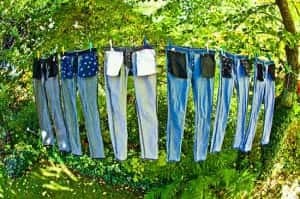 Since washing your jeans too often can do a number on the fabric, most manufacturers recommend that you only wash them when you absolutely must. 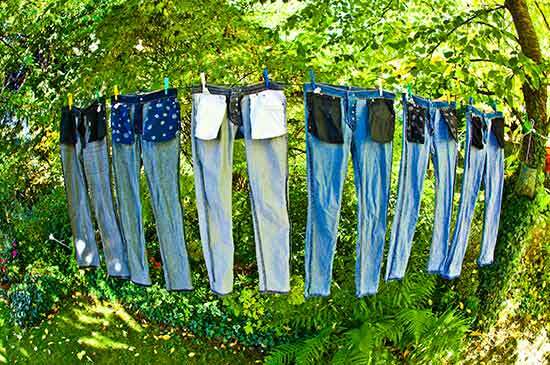 • Hang them out to dry. Line drying saves a lot of energy and helps to preserve fabrics by sparing them the heat of the dryer. • Put old denim to good use. Be sure to donate your old jeans to thrift shops so someone else can enjoy the feel of well-washed denim. If they are too worn out for that, jeans make great materials for crafts and projects. Dust off your sewing machine and try your hand at DIY denim wallets, organizers, bulletin boards, potholders, iPad cases – you name it.